The rush to digital has caused film camera prices to plummet. Many very capable cameras are very inexpensive and can be obtained for under $100 or $200. 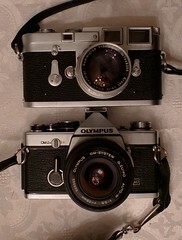 Some film camera prices have remained high due to collector interest. 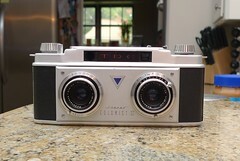 This includes rare versions, cameras in prestine condition, and models with premium and rare lenses. Meet my camera family. They generally are all in use at some level and I've listed them in the order that they are used. Primary Use: This is my go to camera, and is usually pared with my Voigtlander Classic Heliar 50mm f2. Design: Modern 35mm rangefinder with optional aperture priority exposure. Advantages: Hot shoe, AE mode, With kids, it is more convenient to just to have AE, instead of having to set exposure as well as focus. 1:1 finder, meaning I could shoot with both eyes open. It's lower cost and less sentimental that the M3, so I feel more comfortable taking it on vacations. 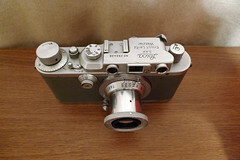 Design: Early 1960s mechanical 35mm rangefinder. Some say its the classic camera. It's been owned in my family since purchased new in the 1960s. It has framelines for 50mm, 90mm, and 135mm which makes shoot a 35mm lens more difficult, but makes focus at 50mm at f/1.52 more accurate. I usually use the 50mm since I am photographing the kids. Primary Use: This has become my primary portrait camera. The 75mm focal length allows me to seperate the subject from the background, even stopped down, but since it is medium format, 75mm is a "normal view." 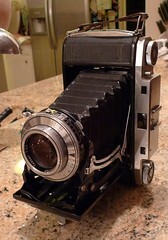 Design: A twin lens reflex (circa 1955) which shoots 12 frames on 120 film. 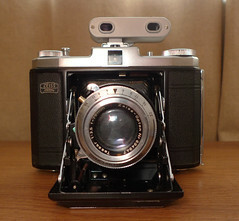 It has a 75mm f/3.5 Zeiss Tessar lens. The big 6x6 negative offers rich detail. Disadvantages: Too heavy and bulky for long travel. With 12 shots per roll, situations where you take a lot of pictures and need to change rolls quickly (wedding, kids birthday party, etc), increases the likelihood that you might miss a shot. 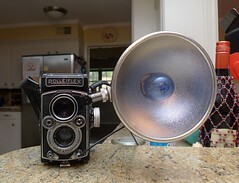 Using a flash requires a flash bracket (unless you are using the flash bulb attachment as shown below). No hot or cold shoe to mount accessories, such as a light meter. No light meter. 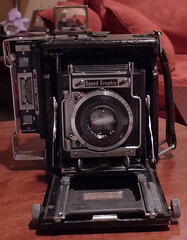 Design: Older screwmount rangefinder which was made in 1938. I usually use a collapsible Leitz Elmar 50/3.5 or a collapsible Leitz Summitar 50/2. Primary Use: Travel camera when I want negatives that could be greatly enlarged. I enlarged one from my trip to London and Denmark to 24" x 36". 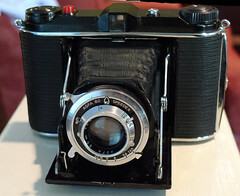 Design: Folding medium format camera with a coated 105/3.5 Zeiss Tessar lens and a Synchro-Compur shutter. Produces 6x9 images on 120 film. Produced the early-mid 1950s. Disadvantages: Focusing is slow, although most shots are at infiniti anyway. Primary Use: Potential travel camera or for a day outing when you want just a few images but of higher quality. Primary Use: Experimental photography - such as double exposures or light graffiti. I've put two rolls through it to date. Design: Folding medium format camera with a uncoated 7.5/3.5 Afga lens (which is likely a Cooke triplet type_ and 7 speed shutter. Produces 6x6 images on 120 film. Made around 1940. Disadvantages: No protection against double exposures. Primary Use: Three dimension photos! I've taken two rolls, one per year. Design: Two Rodenstock Trinar (Cooke Triplet style) 35mm f/3.5 lenses. Produced around 1954. Disadvantages: Mounting slides (common to any stereo camera) is long process. Primary Use: Very pocketable 35mm camera for days when small size matters the most. Design: Tiny automatic with a sharp 35mm f/2.8 lens from about 1997. Disadvantages: Controls are limited to flash on or off. Advantages: Autofocus, TTL Flash, TTL metering. Sometimes you just can't take your time. Disadvantages: currently the bellows have pinhole leaks. Shutter release is only on the lens, not the body. Design: Manual focus SLR with AE exposure from about 1978. Primary Use: I've used it a few times, but none really. Perhaps if I just want one MF shot. Design: Press camera with uncoated 105mm f/3.5 Zeiss Tessar and makes images on 2 1/4" x 3 1/4" sheet film. Advantages: I can take one shot and develop one shot. No waiting until the roll is finished. Disadvantages: Too bulky and slow for practical regular photography outside the home. Only Efke makes sheet film in this size. 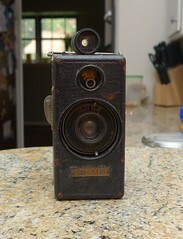 Design: Half frame 35mm camera, produced in about 1928. It has three speed (25, 50, 100) plus T & B. The aperature range is f/6.3 to f/16.